Itext. You text. My grandmother who still thinks Reagan is president texts. But most tv shows and movies shy away from it. Having your characters pull out their phone puts seems to go against the key foundations of cinematics. But it doesn’t have to. Taking tips from Tony Zhou’s video essay, we’ll cover three cinematic techniques to get your characters texting cinematically. Showing texts doesn’t have to be as hard as working. CUT TO: a phone screen. If it gets old after two sentences, you can only imagine how this plays out on screen--when you have to give the audience enough time to read each and every little emoji. Not to mention, it steals focus from your actors, whose reaction is the whole point of getting a text. Instead, cut your texts in half. Do you really need sixteen shots of “Hey, I’m going to kill you” to show a character's in danger? By halving the number of texts in your script, you give more attention to your characters while keeping the essential. You’ve trimmed the fat and left in the most essential texts. You’re now ready to cut to a Samsung Galaxy 7, right? 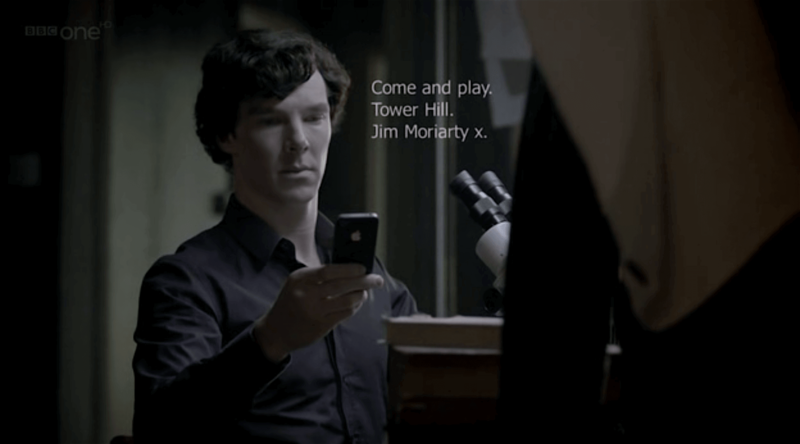 Taking a page from House of Cards and Sherlock, you can simply put the text on screen right next to the receiver. This emphasizes character over technology, and draws your audience in giving them more to watch. Not to mention, it’s a much easier to slap on in post when you’re typing up the credits than film a close-up on a phone. Give your texts flavor though. While placing words next to your character is great, it’s only a place to start. By leaving out the sender name, you give the audience suspense. By changing the font, you describe character. Back in the ‘80s, characters got their information from wise sensei's named Yoda. Today they use Google, which poses a troubling question: how do you show your characters surfing the internet in an interesting way? Too often in movies about computers, we see a guy hunched over a computer, a series of numbers fly through the air, or in both cases Jesse Eisenberg. Instead of splitting the screen between protagonist and computer, showcase the desktop. Have us follow the mouse pointer, zooming in and scrolling just as the main character searches. The rapid surge of information puts us in the characters’ heads and allows us to see what they see. Speed up web searching too. The faster the sequence, the more we follow along and the sooner we get back to your characters. I never thought I’d type this, but check out Popstar: Never Stop Never Stopping. While showing us how far Andy Samberg has fallen, the movie nails social media, hitting us with tweet after snap after tweet. For texting on screen, keeping it simple usually works best. Yet like other exciting aspects of filmmaking, getting texting right is an ongoing experiment. As technology continues to enter cinematics, it has the potential to distract and bog down our stories. Using these film techniques, make movie text a pivotal part of your movie. On paper, you’re ready. You took the courses. You read the books. But do you know all the key cinematography techniques? The things that come from being on set? So whether it’s on paper or on set, we’re gonna make sure you’re ready to shoot. Joey Povinelli is a recent LA transplant from New York where he graduated from Marymount Manhattan College's new Digital Media program. Joey completed his first comedic webseries, The Brooklyn Cycle, earlier this year which has been written up by online publications. Now with his sketch comedy group, Velvet Royales, Povinelli intends to continue producing off-beat comedic content with the end goal of writing for a television series.